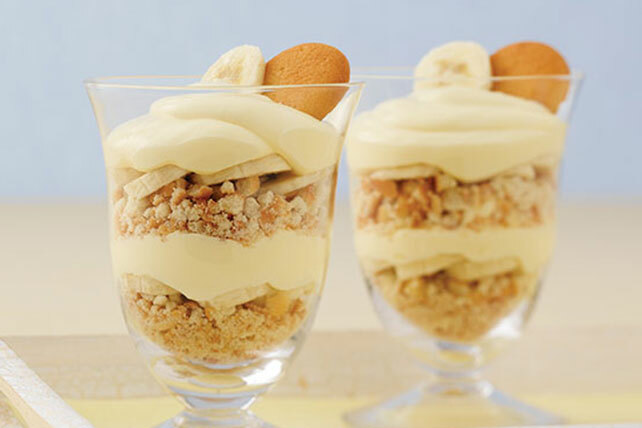 Banana pudding and whipped topping are blended and layered in dessert dishes with vanilla wafers and banana slices for an easy, yet special, treat. Coarsely crush 30 of the wafers; set aside. Pour milk into large bowl. Add pudding mix. Beat with wire whisk 2 minutes. Gently stir in whipped topping. Place about 1 Tbsp. of the crushed wafers and 2 to 3 banana slices in each of 10 dessert dishes; top with 1/4 cup of the pudding mixture. Repeat layers. Top with remaining wafers. Refrigerate at least 1 hour or until ready to serve. Trim 2 grams of fat per serving by using fat-free milk and COOL WHIP LITE Whipped Topping. Substitute JELL-O Vanilla Flavor Instant Pudding for banana flavor. Garnish with additional thawed COOL WHIP Whipped Topping, vanilla wafers and banana slices just before serving. Use 1 pkg. (3.4 oz.) JELL-O SIMPLY GOOD Banana Flavor Pudding.